Posted on October 5, 2018. Filed under Association News. Be the first to comment. 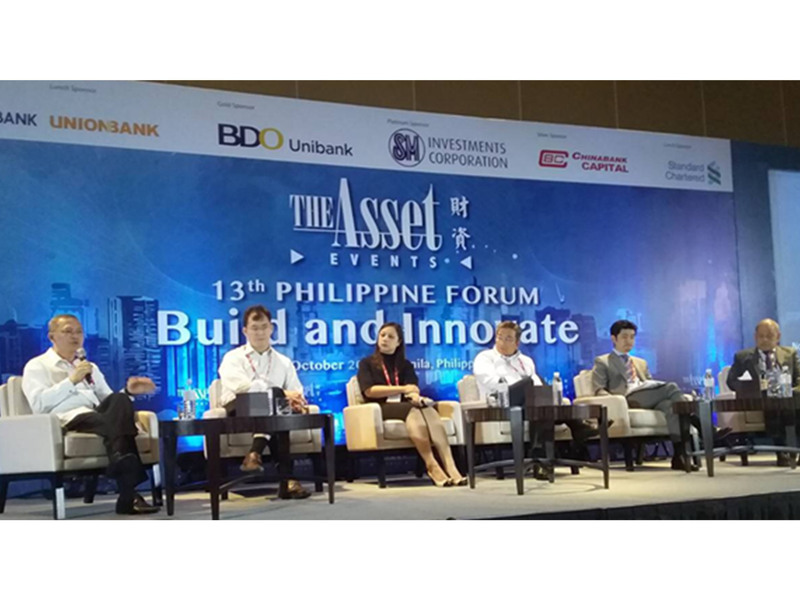 ADFIAP was invited to speak at the 13th Philippine Forum and was represented by Noel N. Verdote, Head of the ADFIAP Finance and Investment Center (AFIC). Mr. Verdote was one of the five panelists in the session on “Green Finance” which also included Michael Yamazoe of Sindicatum Sustainable Resources; Aileen Ruiz of IFC; Joseph Lledo of BDO Unibank; Isaku Endo of the World Bank; with Chito Santiago of The Asset as moderator. Over a hundred participants attend the event. 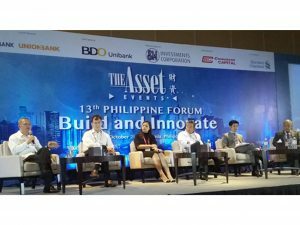 The Forum was organized by The Asset at the Grand Hyatt Manila on October 3, 2018. Mr. Verdote discussed the programs of ADFIAP on green and sustainable finance, and shared examples of the business case of green financing programs of selected member-DFIs in the Asia and the Pacific region. The panel discussed the creation of a green economy which is a priority of the Philippine government, and green financing is at the heart of this plan. It was noted that green instruments have made their debut in the Philippine market, but the transactions are few and far between. As the country transitions to a green economy, the need for sustainable financing is expected to increase. The main issues tackled were how can the country meet the demand for green finance? What are the barriers to scaling green finance and how do we address them? What are the priority areas for green investment? And what green facilities are available in the market today? The Forum with theme, “Build and Innovate”, had industry experts opined that the country’s economic performance in the coming years will be boosted by its grand “Build, Build, Build” programme which requires sufficient capital support from financial institutions. The rising public expenditure could unlock the country’s full potential, improve its attractiveness to foreign investors, stimulate job creation and, ultimately, achieve growth that is both inclusive and broadly-based. The event organizer, Asset Publishing and Research Ltd. https://www.theasset.com/ is an integrated multi-media company serving the elite community of leading corporate and financial decision makers in Asia.